The picks used by top musicians worldwide. Tortex picks are carefully designed and manufactured to give the characteristic maximum memory and minimum wear that made original tortoise shell famous. Dunlop's Tortex picks are available in a variety of shapes and gauges. Tortex gauges correspond to these millimeters/colors unless otherwise noted. Dunlop Manufacturing produces many different types and sizes of picks to suit the varied preferences of today's musicians. Dunlop's wide variety of gauges, shapes, sizes, and materials allows the player to select the exact pick for his/her own particular style of playing. Exceptionally crafted and finished picks for every player's needs. "My first experience with Dunlop Tortex Picks." 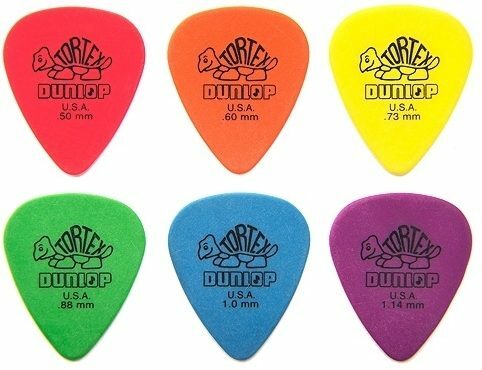 Sound: Currently I purchased the Dunlop Tortex picks orange color 0.6 mm for the first time and these picks really impressed me due to the fact that these tends to make a solid and rich/bright sound as well as these do not slip from your fingers and I found them with good griping tendency. These picks are very durable and resist quick wearing out. They are probably the toughest picks I have ever used with right amount of flexiblity. One thing more good about these picks is the low level of clipping noise produce by them as compared with other brand picks. I must add by saying that I found them excellent in all respect. Feature: The most useful feature is its high gripping or non slipping quality. Ease of Use: Oh of course these picks are a lot easier than other picks and you will love them. Quality: No doubt about it that these picks belong to A1 quality. Value: These are of brillant value and one will never regret after buying and using them. Manufacturer Support: No The Wow Factor: After experimenting with these picks I have again placed an order for more such picks. These picks are irresistable. Overall: Overall quality and feel of these picks is superb. Style of Music: Rock, Country and Blues. Sound: This pick gives you a well-rounded sound. Feature: The plastic used is really smooth and soft, while still retaining the stifness of the pick. Ease of Use: It's easy to hold since the plastic is so smooth and soft. Also, when you drop it, it's already a bright color, so it's easy to find. Quality: These picks are 100% trustable. Value: The price of picks is virtually the same anywhere. Manufacturer Support: Support? Please. Who calls a company to ask how to use a pick? The Wow Factor: If I could use one pick for the rest of my life, I would choose the light-blue pick with the kickin' little turtle on it. The 1MM's are my favorite. 1.14 close behind. Overall: These picks are the best picks I've ever used. I can trust them 100%.